The (latent) heat of vaporization (∆Hvap) also known as the enthalpy of vaporization or evaporation, is the amount of energy (enthalpy) that must be added to a liquid substance, to transform a given quantity of the substance into a gas. The enthalpy of vaporization is a function of the pressure at which that transformation takes place. 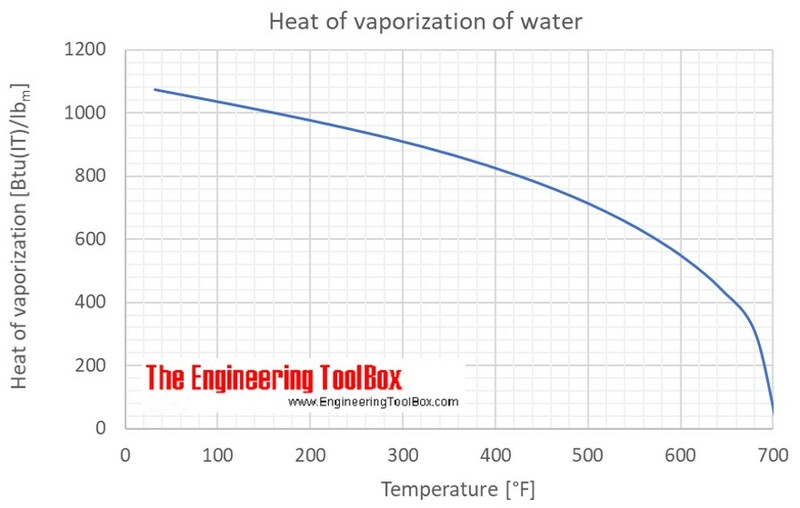 The heat of vaporization diminishes with increasing temperature and it vanishes completely at a certain point called the critical temperature (Critical temperature for water: 373.946 °C or 705.103 °F, Critical pressure: 220.6 bar = 22.06 MPa = 3200 psi ). The calculator below can be used to calculate the liquid water heat of vaporization at vapor pressure at given temperatures. The output heat is given as kJ/mol, kJ/kg, kWh/kg, cal/g, Btu(IT)/mol and Btu(IT)/lbm. For vapor pressure - check tables below. See also Water Boiling points at high pressure, Boiling points at vacuum pressure, Density, specific weight and thermal expansion coefficient, Dynamic and kinematic viscosity, Enthalpy and entropy, Ionization Constant, pKw, of normal and heavy water, Melting points at high pressure, Saturation pressure, Specific gravity, Specific heat (heat capacity) and Specific volume for online calculatores, and similar figures and tables as shown below. Engineering ToolBox, (2010). 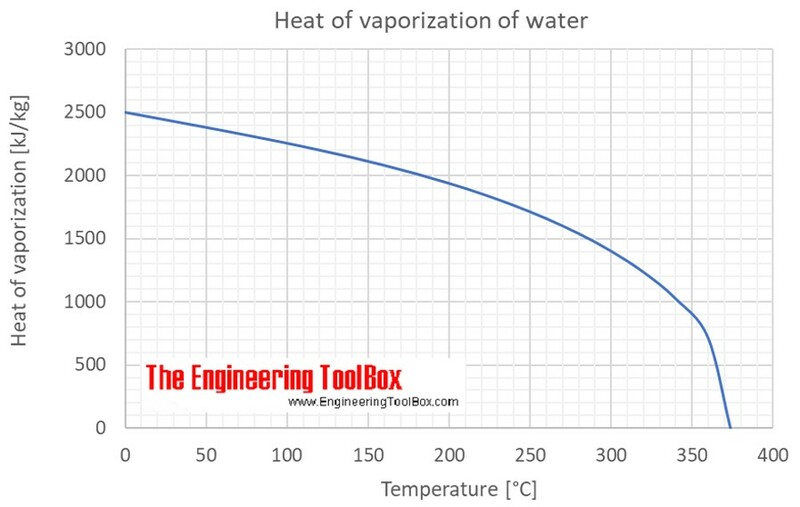 Water - Heat of Vaporization. [online] Available at: https://www.engineeringtoolbox.com/water-properties-d_1573.html [Accessed Day Mo. Year].